Coconut Macaroons are chewy and moist on the inside, and crispy and golden on the outside. They are delicious, easy to make, gluten-free and require only 5 ingredients! We love them plain, but they are even better when dipped in chocolate. Our other favorite sweets are chocolate chip cookies, no-bake peanut butter bars, and paleo coconut crack bars. 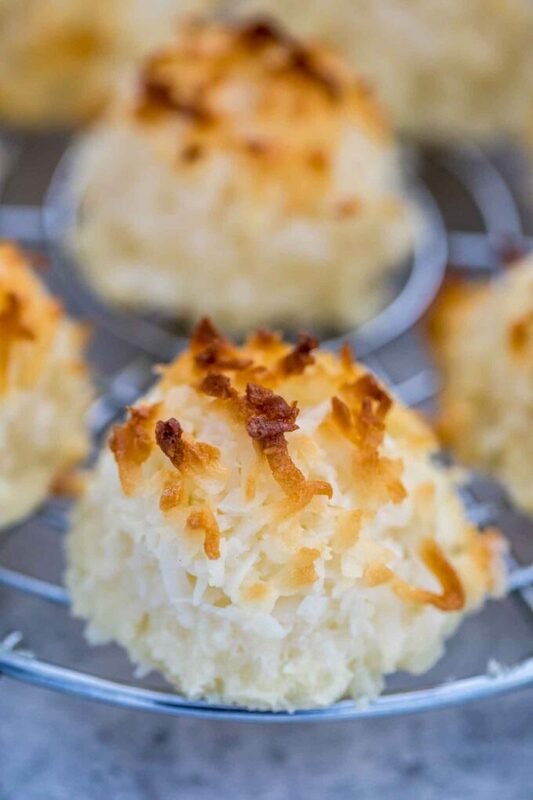 We’ve tried many dozen of various coconut macaroons recipes, and came to the conclusion that this version is the best one. They are simply irresistible, with a nice crunchy texture on the outside and chewy in the middle. They are also gluten-free and are great for people observing Passover. Making them require a few simple ingredients such as shredded coconut, egg whites, condensed milk, vanilla extract, and semi-sweet chocolate if you want to dip them in chocolate. It takes about 10 minutes to prepare, and another 25 minutes to bake. 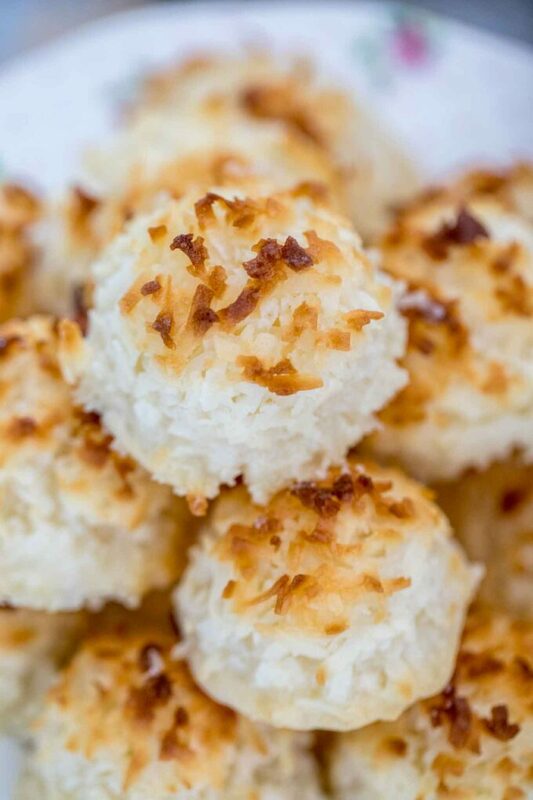 So don’t wait for too long, and get ready to make some of the best and most delicious coconut macaroons! 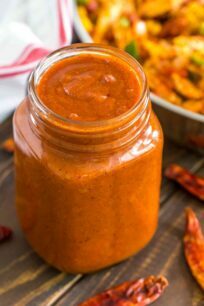 There are countless ways that you can tweak this basic recipe. For example, adding more coconut and chocolate, or egg whites and sugar for an even crunchier version. If you love coconut and a good dessert, then we are quite sure you are going to love them! What is the difference between a macaroon and a macaron? Although they sound and spell similar, they are completely different cookies. First off, a macaroon is coconut based, whereas a macaron is meringue based. Also, macaroons are usually shaped in little mounds and have a chewy texture, and are mostly limited in variety. In contrast, macarons can be made in a variety of colors and flavors, and are sandwiched around a filling. WHY DO MY Coconut Macaroons COME OUT FLAT? If they flatten when baked, it might be dues to a few reasons. First, it is important not to over-mix the ingredients, and to measure all of the ingredients correctly. Please try to follow the recipe steps closely not to miss out on any steps. Also, it is important to refrigerate the macaroons for the perfect texture. They need to be cold prior to baking, otherwise, they’ll drop too much. So if they start spreading out too much once out of the refrigerator, return them to the refrigerator for another 15-20 minutes. The batter has to be cold prior to baking to avoid spreading while in the oven. HOW to store COCONUT MACAROONS? They store pretty well! Best kept at room temperature in an airtight container for up to 10 days. In addition, they may also be individually wrapped (after baking and cooling completely) and frozen in an airtight container for up to 6 months. These easy macaroons are also naturally gluten-free, so if you are on a gluten-free diet, they are the perfect treat. Avoid over-baking. Only a precise 25 minutes, or until golden brown. Over-baking will dry out them out, which you want to avoid! Also, please note, that sweetened condensed milk and evaporated milk are not the same thing, so make sure not to confuse the two. Use an ice cream scoop to scoop the coconut mixture. This will ensure the cookies are same-sized, and the cooking time will be equal. This way you don’t overburn or undercook them. Another trick to use would be to pulse your shredded coconut in a food processor. 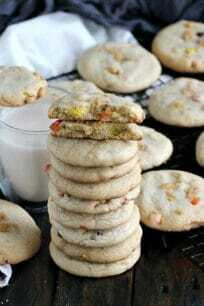 This will really break it down and help create tighter and more compact cookies. In addition, ensure there are no remnants of egg yolk whatsoever. Just egg whites are used here. Macaroons can be dressed up in so many different ways. For example, they can be dipped in white or dark chocolate, or topped with sprinkles. 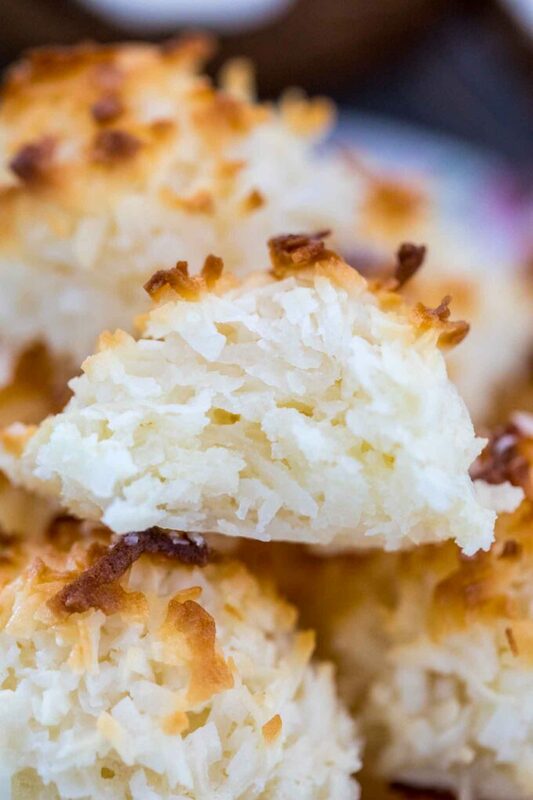 Coconut Macaroons are chewy and moist on the inside, and crispy and golden on the outside. They are delicious, easy to make, gluten-free and the perfect treat to tame a sweet tooth! Add egg whites and salt to a medium bowl and beat on high speed until firm peaks form. Add coconut, condensed milk, and vanilla to a large bowl and stir until fully combined. Add the egg whites to the bowl and carefully fold into the coconut mixture. Use a two tablespoons cookie scoop, to drop equal amounts of the coconut batter onto the prepared baking sheet. Bake in the preheated oven 25 to 30 minutes, until golden brown. im a huge fan of macaroons but never thought to make them coconut flavor! YUM! this would be a huge hit at a party im attending this weekend! OK now these sound absolutely delicious! I do love a coconut sweet and these macaroons sound like they would perfectly fit that want from time to time. I just love these! It’s been ages since I’ve had some. I really need to make them. Generally I just buy a bunch from the store. Oh my goodness these look amazing! I cannot wait to order these ingredients and make them this weekend! Everyone in our family loves coconut. Those look perfect. I have never learned to love coconut strands but boy, if I was going to, this would be the one! For many years I disliked coconut, so I always skipped the macaroons. However, I think I might like macaroons now. These sure look delicious! I love coconut macaroons so much but mine always come out flat. I’m going to try your recipe and tips and see if I can’t make them right for a change. Oh my goodness you got my sweet tooth now! 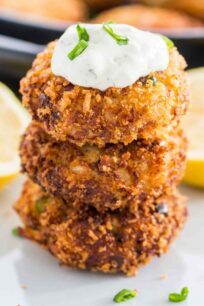 These look so good, I can’t wait to try this recipe! I LOVE coconut!!! Delicious coconut macrons my favorite., I love them drizzled with chocolate also. Your recipe is perfect. My husband just bought some coconut macaroons from the store last week! I love coconut or coconut flavor desserts! I love coconut macaroons and my sister and I used to make that regularly back in my hometown. I’m going to make some again. I can’t wait to try your recipe! I’ve never made them, but love eating them! I love how easy these are to make! They’re delicious, and perfect for Easter but OMG so simple to make! Yes, they are so easy to make! We love coconut.. this sounds absolutely delicious! I have never tried making my own macaroons, but it would be fun to try.